Are We Still Worried? | When Do They Serve The Wine? This cartoon was published in The New Yorker in the months following September 11th, 2001. I think it’s appropriate to publish here again, with news of the death of Osama Bin Laden yesterday. 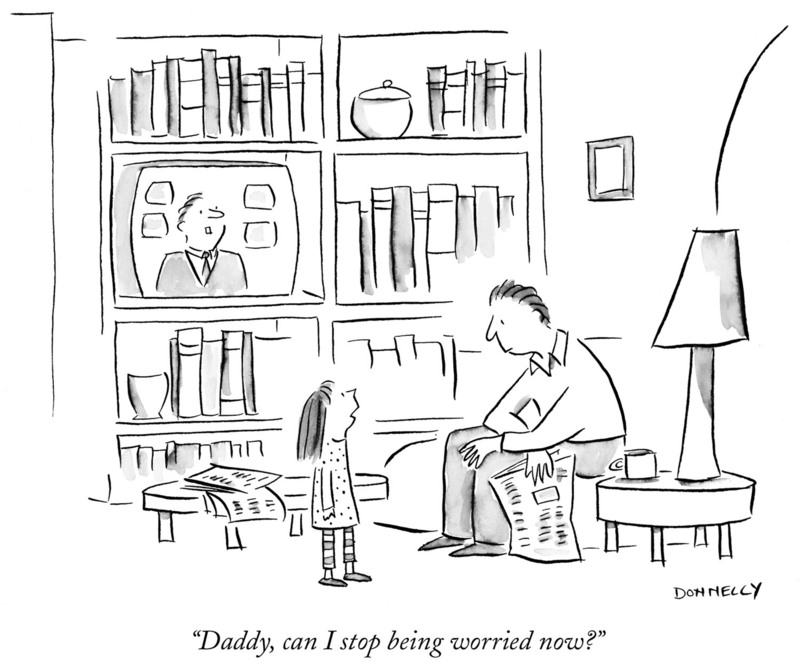 The little girl in this cartoon would be about eighteen now, and would probably still be worried today. New York City, and those who lost loved ones in the attacks on 9/11 may feel some relief, but the people who listened to and followed Bin Laden are still out there, hating Americans. President Obama is doing an a remarkable job to make our country new again, to work with our allies and the world to solve problems and rid the world of terrorism. But it’s not going to happen with the death of one individual, no matter how powerful he once was. Let’s hope the Arab Spring continues and combined with this news, we are one step closer to peace. This entry was posted in Uncategorized and tagged 2001, Al-Qaeda, Barack Obama, Cartoon, New York City, New Yorker, Osama Bin Laden, September 11, Terrorism, United State. Bookmark the permalink.